Mr. Bejelly has asked me to make Paleo Pretzel Dogs for weeks and, well, I put him off and off until he put down his foot down. The man hid my tablet until I made them. Mr. Meany that he is, he should be glad that I’m a kind soul, and that I didn’t put too much salt in them to teach him a lesson. Anyhow, this recipe uses my Paleo Soft Pretzel recipe as the crust and the only thing I would do differently is increase the cook time of the recipe so that the dough is firmer. My son gobbled them down and begged for more. These would make the perfect school lunch for your kid and I plan to make these often for the Little when he heads to school. Make the Paleo Soft Pretzel recipe and instead of rolling the dough into pretzel shapes wrap around the hot dog as shown. Now that looks delish! I’m going to have to try this soon. I have to laugh that he forced you into it! I’ll bet the pretzel dough tastes fabulous with these. These look so good. Perfect for mom and kids! 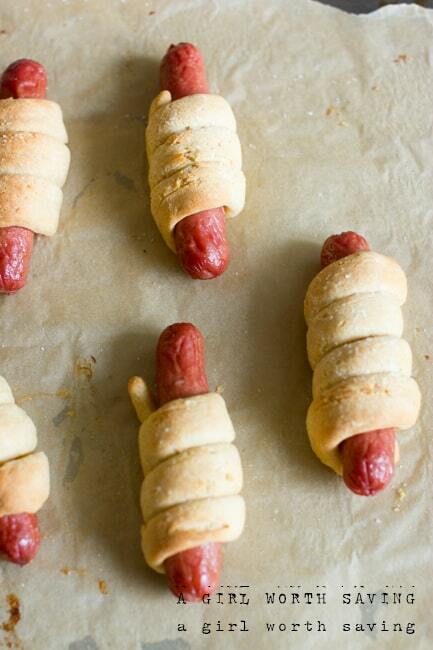 Oh I love me some Pretzel Dogs and so kid friendly! Looks great! I had no idea hot dogs were paleo! Kelly, these look awesome! I love the idea of a pretzel around the hot dog, super cool! Yum Yum and they don’t need any ketchup this way. love pretzel dogs but what kinda of hotdogs do you use? I used the Applegate hot dogs. Seriously the best hot dog in my book with no filler and such. A winner for our family! I used to always buy vegetarian pretzel dogs and then they stopped making them. Sad! Maybe I should follow your lead and try making them myself! these look delish! I must try them! they look great Kelly. I think they would be perfect for a cookout/picnic. Looks just yummy! Very well described! WOW. You are a genius! These look so amazing well done. My nieces would love working with pretzel dough. Thanks for the idea. I am going to have to try that pretzel dough! Do you think i could make the dough the day before wrap some hotdogs and refridgerate or freeze until its time to cook? I would let the dough come to room temp if you do this. Honestly, I’ve never done this! Please share how it work out! Sorry it didn’t work out hun! I hope they enjoy it Manda! Can you substitute almond flour for the tapioca flour? You really need tapioca flour as it acts as the protein and “glue” in this recipe hun. My dough is so crumbly 🙁 I added an extra egg AND some water. I don’t have a processor, it just broke and I haven’t been able to find a suitable replacement. I don’t want to waste this dough. It’s wrapped in the parchment in the fridge. Help!??! What did the dough look like after you put it in the fridge? Did it firm up? 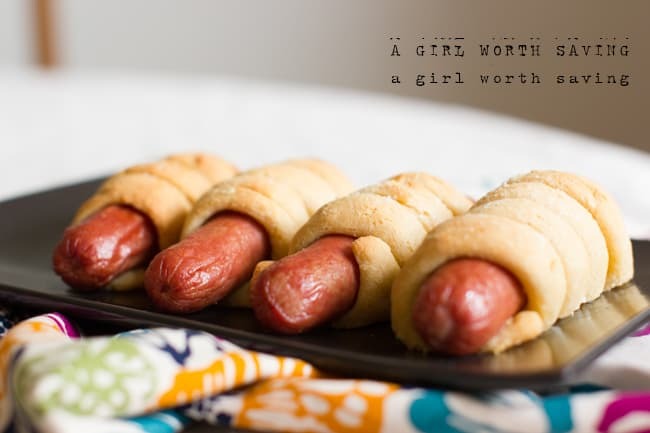 Such a long time baking – the hotdogs look a bit dry. Did they taste a bit dry? Mine weren’t dry. Perhaps your oven runs hot and you need to reduce the cook time? These are so good, I’ve made them twice now. Once with Applegate dogs and once with another brand, name slips my mind. When I made them with the off brand, the dogs dried up. They were edible but just dry. The second time I made them, with the applegate brand I also decreased the cooking time down to 25 minutes. They came out so much more juicy then the first time. I’m not sure if it was because of the brand or if it was the reduced cooking time. Either way the pretzels themselves were delicious. The second time around I also sprinkled some onion powder garlic powder and oregano as well. Yum! Interesting. I never would have through the brand would affect the outcome of the pretzel. I am finally getting more adventurous with my Paleo and AIP menus. Can I substitute the egg for a gelatin egg? Thanks. and LOVING your site! Yes Olivia that should work fine! I followed the directions carefully, and mine did not form a dough. It was crumbly and wouldn’t hold 🙁 disappointed! Sorry Kerry. Tapioca is a tricky flour. Did you try adding another egg? Oh no hun . Hrmm. . did you watch the video? https://www.youtube.com/watch?v=oPsRGTq3EYQ You could use the pizza recipe and I think it would work out just fine. These turned out awesome! The dough worked really well for me. I’m glad I watched the tutorial video, I think that helped me to get it right. The bread around the hotdogs got nice and golden brown and was chewy like a soft pretzel. I will definitely make these again. Yeah! So glad it worked for you Gina! The paleo pretzel recipe is not working. Can you upload again or send to my email above. I made these today, and they’re amazing! My kids (and me!) loved them. I used Applegate Organic Stadium hot dogs & they turned out perfect. So glad you enjoyed them Tami! We had made the Paleo Soft Pretzels before (maybe a couple years ago?) and I remember the dough working out okay, but this time it was awesome. It was really easy to work with. 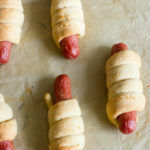 We made mini pretzel dogs (using Beelers Lil’ Bites) and my kids LOVED rolling the dough and putting them around the sausages. They did spirals, covered some completely with dough, and also used the dough to mold a “hot dog bun” on just one side. So easy and fun! Can you make ahead and freeze? Do you fully cook or freeze uncooked? I would cook them for half the baking time to let them set. Then cool and freeze. Then cook for the rest of the time. I only cook for one. I am wondering how long the dough will keep in the refrigerator. Another option: do think cooking the dough in long lengths and wrapping the cooked dough around a hot dog when I am ready to cook one would work? I would make ahead the pretzels and only parbake them. When you are ready to eat them you can cook them fully hun.